The quality management standard ISO 9001 is the most important standard in quality management (QM), nationally and internationally. Since 2013 we are certified according to ISO 9001. In addition to the external audits, regular internal audits are carried out together with staff training. To be able to meet the requirements at any time through appropriate and defined processes. To discover and avoid mistakes as early as possible. To reviewing and constantly improving the effectiveness and efficiency of processes. The environmental management standard ISO 14001 is the most important standard in environmental management (UM) nationally and internationally. Since 2013, we have been ISO 14001 certified. It is our responsibility to protect nature and conserve resources. 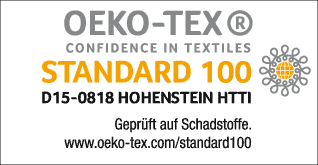 All products have been certified to OEKO-TEX Standard 100 since 2015. This includes all cellulosic and synthetic fibers and their mixtures undyed, dyed and printed.